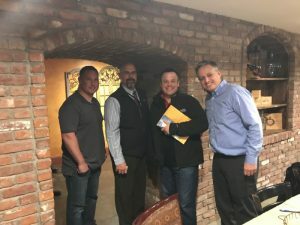 Our guest speakers at the December 7, 2017 finance meeting of the GNBLA were John Ray, Kevin Melo, Chris Gallo and Mark Fosella. Great news, John was speaking about the Landlord’s Association new Facebook page. Go see it. Chris & Mark are hard-money lender’s at Summit Properties. Kevin Melo is a mortgage officer at Bay Coast banks. They would all be happy to hear from you and discuss your best alternatives. Next month’s meeting will be on January 4, 2018 (Happy New Year) and will feature the head of the Police Gang Unit, Attorney John Walsh talking about the best (always difficult)way to evict problem tenants, Mike Silva from New Bedford Guide will observe, someone from the Standard Times and New Bedford’s leading politicians. This is a great time to have your voices heard. Landlord’s need to tell our side and impact change. This will be the start of a very important conversation.